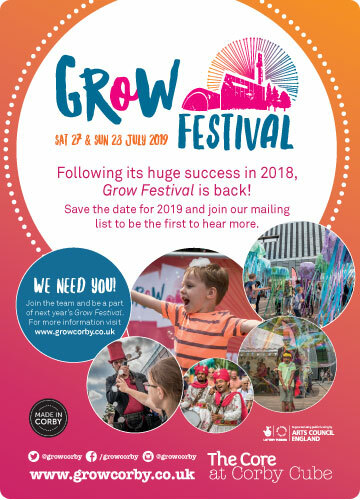 Grow Festival is looking for creative artists to be a part of this exciting outdoor arts weekend in Corby. Saturday’s activities will culminate with a parade for members of the community in the late afternoon. Responding to the theme of food, the festival is looking for artists to work with different Corby communities to create large carnival style objects for the procession, to deliver drop-in workshops running up to the festival and to run workshops on the Saturday itself where families can create something to carry as part of the parade. The objects created will then be displayed at the feast on Sunday. View the full brief and how to apply here. Grow Festival 2019 is inspired by the theme of food and feasting and will animate Corby’s town centre with hilarious street performers, magical family pop-up shows and spectacular art over the weekend of Sat 27 and Sun 28 July 2019. On the Saturday the town centre will host music, dance, interactive installations, walkabout acts and performances for all the family. For the Sunday focus will shift to a massive community feast sharing and celebrating the food and cultures of Corby.